Ash Tree Cottage, New Park Farm in Nr Bassenthwaite Lake, Keswick sleeps 3 people. 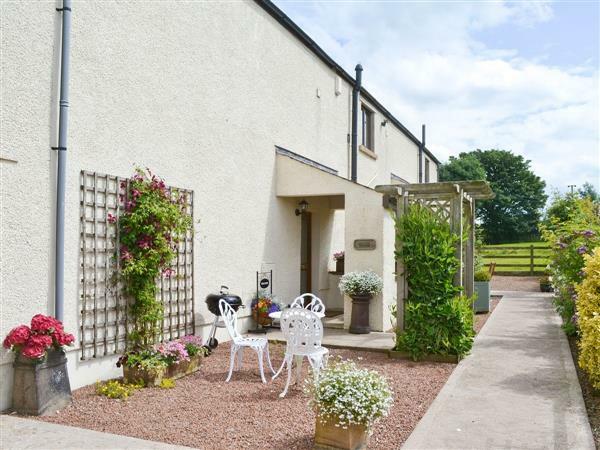 Peacefully located and surrounded by stunning scenery with spectacular views, these delightful cottages have been carefully converted from the barns of a former farm steading. In an Area of Outstanding Natural Beauty, the holiday properties (refs LF3, LF2 [Ellen Cottage]) are two in a little group of four, located between Torpenhow and Ireby on the northern fringe of the Lake District. Attractively furnished, well presented and equipped to E.T.C. 5 Star standard, the living accommodation is on the first floor to take advantage of the outstanding views, including stunning sunsets over the Solway. There are pleasant walks and cycle routes from the door along lanes filled with wild flowers and wildlife, such as the occasional red squirrel and deer (excellent bird-watching). Popular Keswick (on the shore of Derwentwater) and Cockermouth (birthplace of William Wordsworth) are full of shops, restaurants, galleries and tourist attractions, the former with a leisure pool and the latter with a swimming-pool. Romantic, quiet and peaceful, yet an ideal base for the Lakes, Solway coast, Scottish borders and Hadrian’s Wall, there are several pretty villages nearby. Sailing on nearby Lake Bassenthwaite. Armathwaite Hall Hotel, a 10-minute drive, offers a swimming pool, gym, sauna, Jacuzzi and steam room. Shops 5 miles. Double bedroom with pretty lace-draped four-poster bed. Attractive single bedroom. Bathroom with over-bath shower and toilet.First floor: Spacious open-plan living/dining room with electric ‘wood burner’, kitchen area and French windows with wonderful countryside views. Ash Tree Cottage is in Cumbria; should you be on the lookout for a special offer, you can find all the special offers in Cumbria. It's always worth checking to see what is on offer at the moment. Do you want to holiday near Ash Tree Cottage (LF3), you can see other cottages within 25 miles of Ash Tree Cottage; have a look to find your perfect holiday location.